Upgrading from Windows Vista to Windows 7: Can Your System Handle It? Jvness asked the Windows forum about upgrading an older, 32-bit version of Windows to 64-bit Windows 7. There are two questions you have to answer. First, is your PC compatible with Windows 7 (and that includes your peripherals and your programs)? Second, does it have a 64-bit processor? To answer the first question, install and run the Windows 7 Upgrade Advisor. Not only will this free Microsoft program tell you if you can install Windows 7, but what you need to change if you can't, and what may cause problems after you do. It can also answer the second question. After it finishes running and presents its report, look to the top of the window. If you see separate "32-bit report" and "64-bit report" tabs, then you're running an x64 processor and can upgrade to the 64-bit version of Windows 7. Be sure to click that 64-bit tab and read what it tells you about the transition. But there's a quicker way to get a simple thumbs up or down on the 64-bit question. Download and run Gibson Research's Securable. 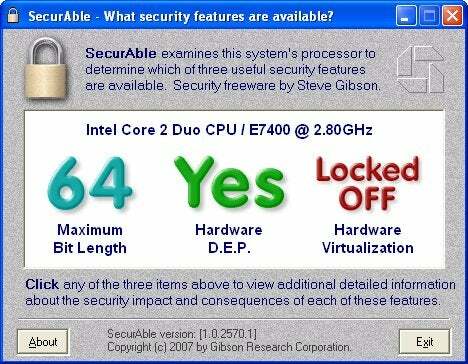 Steve Gibson designed this program to examine your CPU and tell you about its security features. But as an added bonus, when Securable comes up on your screen, you'll see either a great big 32 or a great big 64. For more on these issues, see How to Upgrade to Windows 7, How to Upgrade From XP to Windows 7, and 32 vs. 64: What Bit Windows? By the way, before it became shorthand for binary digit, the word bit meant 1/8th of a dollar, or 12.5 cents. (You've probably seen a movie where an old-timer says that something costs "two bits." That's a quarter.) So shouldn't a 64-bit operating system cost only $8? I'd like to thank Rgreen4 and Flashorn for their contributions to the original forum discussion, as well as LiveBrianD for helping me research this post (see this discussion). Please note that, due to a technical problem, the Securable URL above had to be changed a few hours after this article went live.